Free Reception, Exhibit Opening, & Panel Discussion at Main Library 6-8 p.m.
Share your Fairness memories here! 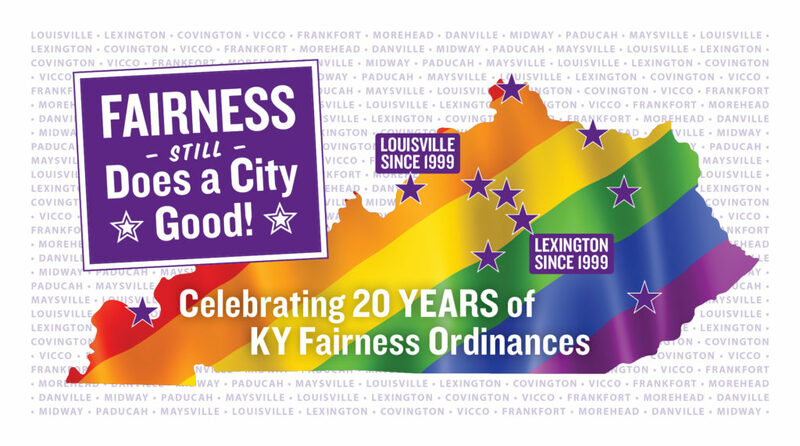 The Fairness Campaign will celebrate the 20th anniversary of Louisville’s historic LGBTQ Fairness Ordinance Saturday, January 26 from 6:00-8:00 p.m. at the Main Branch of the Louisville Free Public Library (301 York St., 40203) with “Fairness Still Does a City Good,” a free exhibit opening, reception, and panel discussion with former Board of Aldermen members and Fairness leaders from 1999. Current Metro Councilman Bill Hollander will also be on hand to make a special announcement regarding the future of LGBTQ rights in Louisville.On January 26, 1999, the Louisville Board of Aldermen approved Kentucky’s first LGBTQ discrimination law with a vote of 7-5. Aldermen voting for the ordinance included the five co-sponsors–Tina Ward-Pugh, Bill Allison, Denise Bentley, George Unseld, and Paul Bather–as well as now-State Representative Reginald Meeks and Board of Aldermen President Steve Magre. 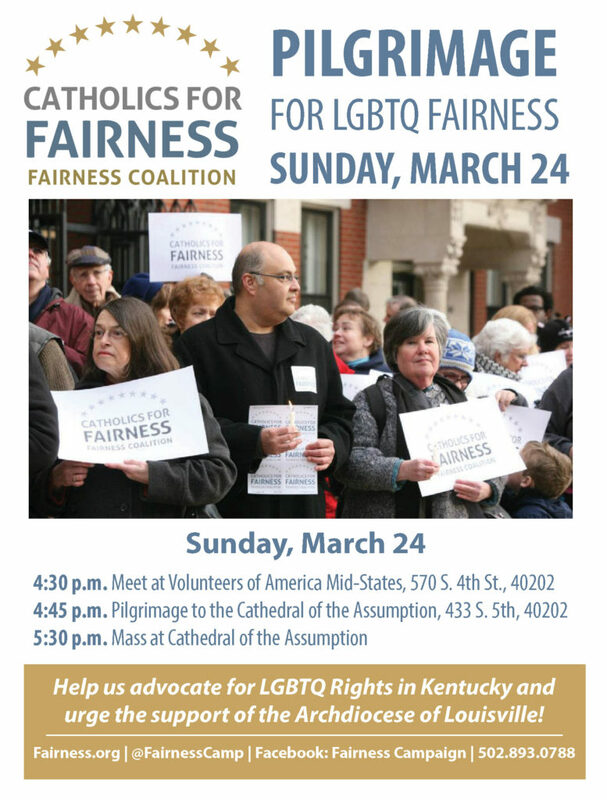 Many of the original supporters of the Fairness Ordinance will share their memories with the crowd January 26, including Magre, Allison, Meeks, and Ward-Pugh. They will be joined by Fairness Campaign co-founders Carla Wallace, Pam McMichael, Lisa Gunterman, Ken Herndon, and Jeff Rodgers, as well other leaders like Alicia Pedreira, whose firing from Sunrise Children’s Services helped spur passage of the 1999 law, and former Metro Councilwoman Cheri Bryant Hamilton, who served as Clerk of the Board of Aldermen. The commemoration continues through March 17 with the Louisville Free Public Library’s Main Branch exhibit, “Fairness for All: Celebrating the 20th Anniversary of Louisville Fairness Ordinance,” where library visitors will be able to walk through the history of the 1999 Fairness Ordinance, including 1995 “Fairness Does a City Good” yard signs, the 1,000+ page “Case for the Passage of Fairness,” and even Carla Wallace’s original “Fairness No More, No Less” t-shirt. Visitors will also be able to download an audio file compiled from oral histories of Fairness leaders. The Louisville Free Public Library’s exhibit is in partnership with the Williams-Nichols Collection housed in the University of Louisville Archives and Special Collections and UofL’s Anne Braden Institute for Social Justice Research. A mirror exhibit will be on display at UofL in Ekstrom Library Lower Level East Wing. 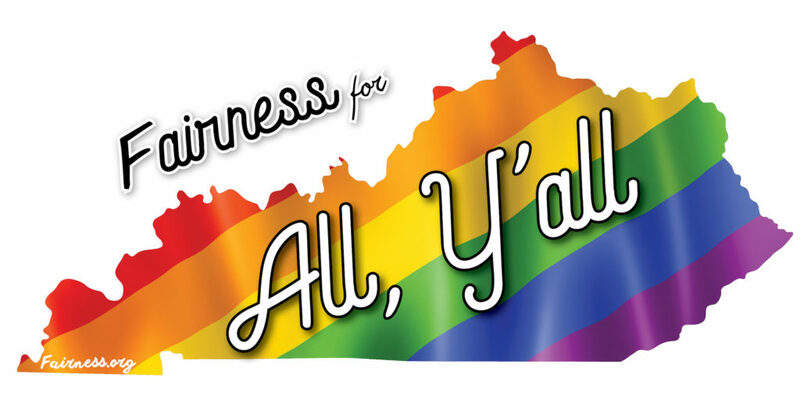 On July 14, Lexington Fairness and the Lexington Free Public Library will open an exhibit celebrating the 20th anniversary of Lexington’s LGBTQ Fairness Ordinance. Today, ten cities across our Commonwealth extend the same LGBTQ protections that Louisville and Lexington did in 1999, including Covington, Vicco, Frankfort, Morehead, Danville, Midway, Paducah, and Maysville. WHEN: Saturday, January 26 from 6:00-8:00 p.m.